Since starting to listen to, and watch podcasts, I have been exposed to a new section of the knitting pattern design community. I think podcasters are led to design in the same way that bloggers are. They tell their audience about something they have designed for themselves and people start asking if they are going to release it as a pattern. The next thing they know, they are a designer! Megan Williams is such a podcaster, part of the Stockinette Zombies duo, Amy Spinler being the other part. 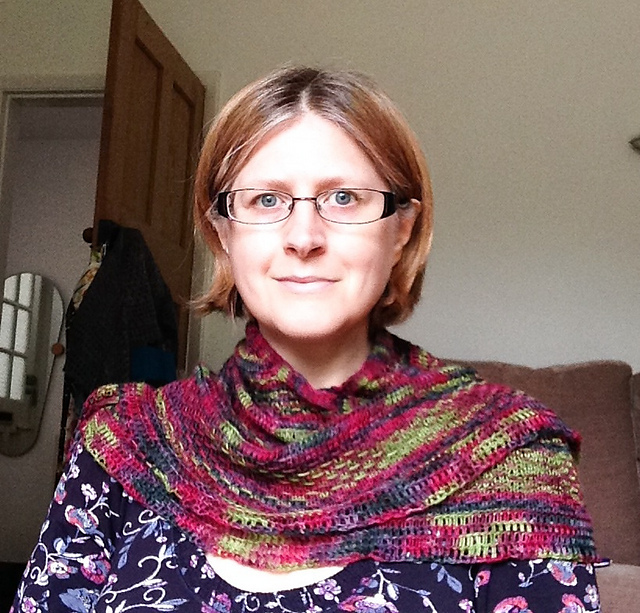 In July, Megan released a new shawlette pattern, Cool Clavicle Cover. It looked like something I would enjoy knitting and it was one of my favourite shapes, an elongated semi-circle. A few months later, I pulled out this skein of SweetGeorgia Tough Love Sock in the Tea Party colourway and started working on the shawlette. This was the first time I have used this particular yarn and it is very smooth and soft. It felt amazing next to the skin and I couldn't bring myself to put it on my feet, despite knowing it was more than tough enough to stand up to being socks. 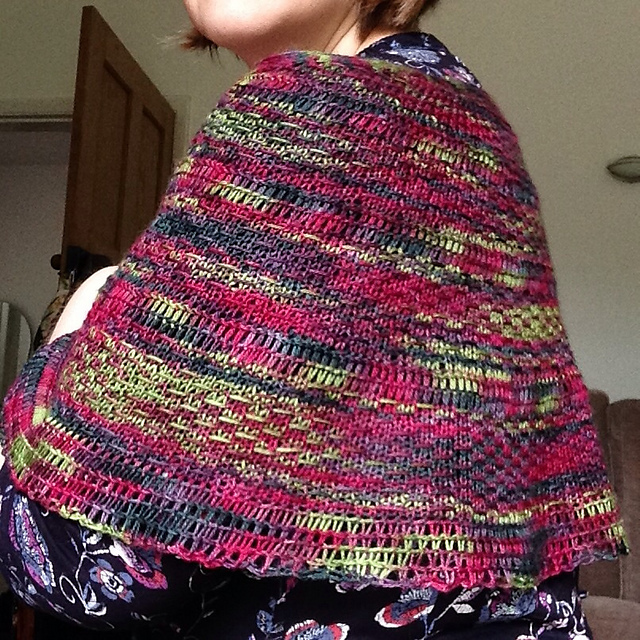 The cast on and top edge of this shawl is really unusual and very imaginative. This method of cast on and top edge seem to remove the problem of a top edge bulge that sometimes occurs with this shape of shawl. 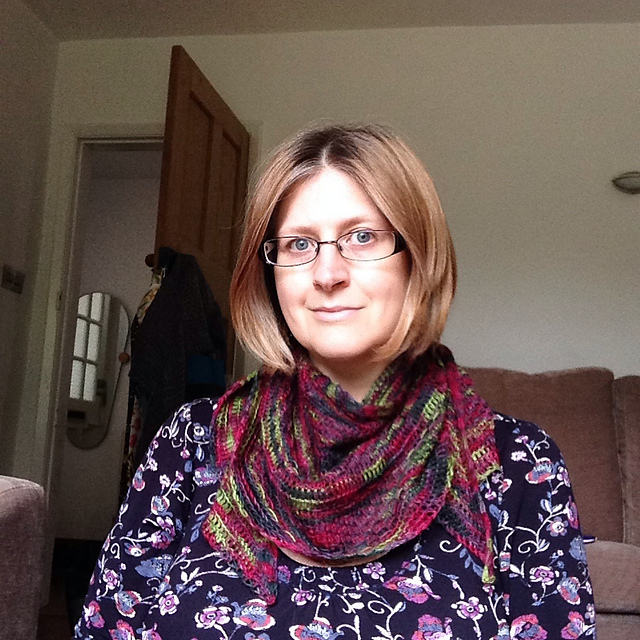 It creates a soft and smooth top edge, which you sometimes don't get with a garter stitch top edge. 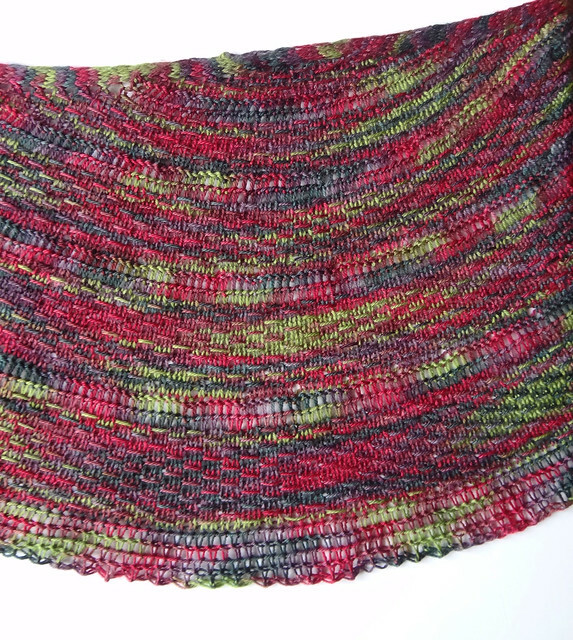 There are several sections of the shawl, done in the same stitch pattern, that breaks up any pooling or flashing you might get with a hand dyed variegated yarn. The main sections are divided with an interesting "chain stitch" that I'd not seen before. 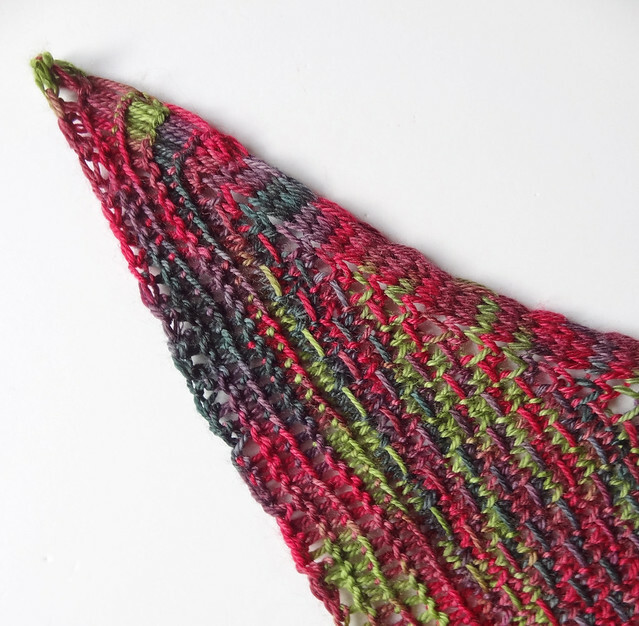 These sections help break up your knitting and help keep it fresh and interesting. These two different types of stitch keep you thinking enough without forcing you to be glued to a pattern, as they are easily memorisable. I did go wrong at the beginning because I forgot that the stitch counts given in the pattern, are for the stitches BETWEEN the stitch markers! And yes, I did rip out those sections before realising that the stitch count I had was actually correct. Other than my user error, the pattern was fun to do and the shawlette is great. The shawl really is a good clavicle cover. It sits nicely around my shoulders, but still can cover up my upper arms nicely. It is also a good size to use as a scarf. When it's worn that way, you really get the benefit of how smooth and soft this yarn is. 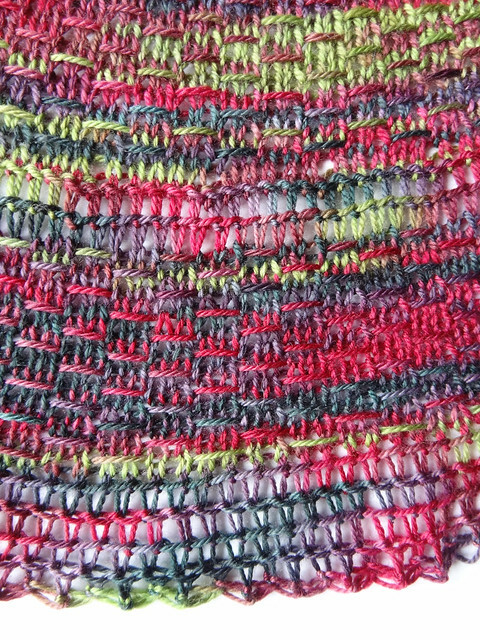 I wet blocked the shawlette using blocking wires and it made all the edges nice and smooth. I think it would be hard to duplicate this effect without using a LOT of pins. I think this shawlette would work really well being sized up, by using two skeins of sock yarn, or even using a longer skein of 3-ply weight yarn (heavy lace). 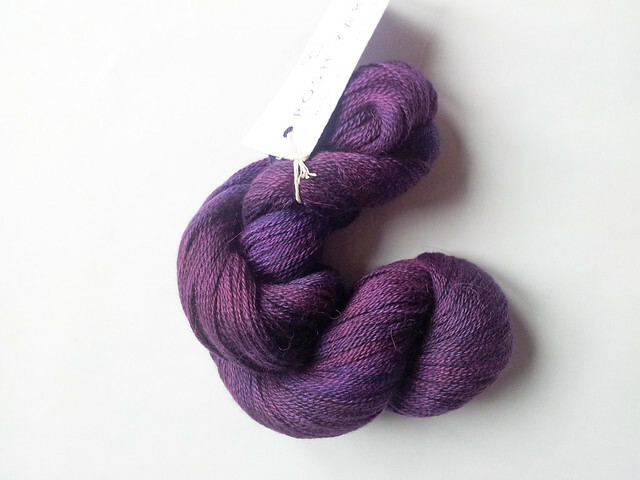 It's the sort of thing that would work well with a skein like my Posh Yarn Miranda Heavy Lace in Smooth Criminal. 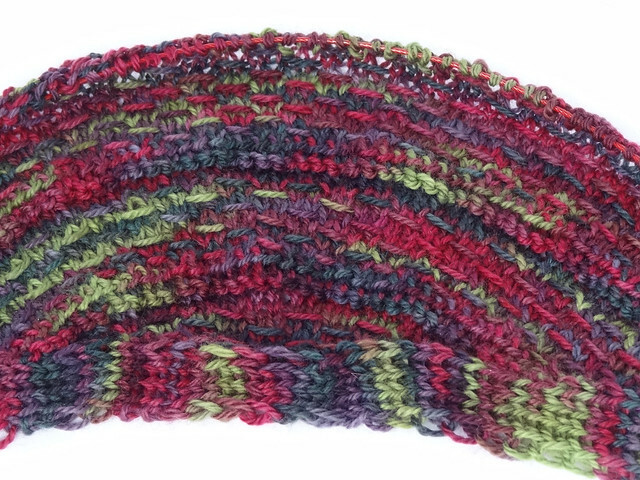 You can see the different yarn choices used with the pattern here. I think a precious variegated sock yarn would be shown off well with the pattern, and I'm pretty sure I will knit it again. I think you can tell I really love my new shawlette and have worn it a lot already, and just as importantly, I enjoyed knitting it. 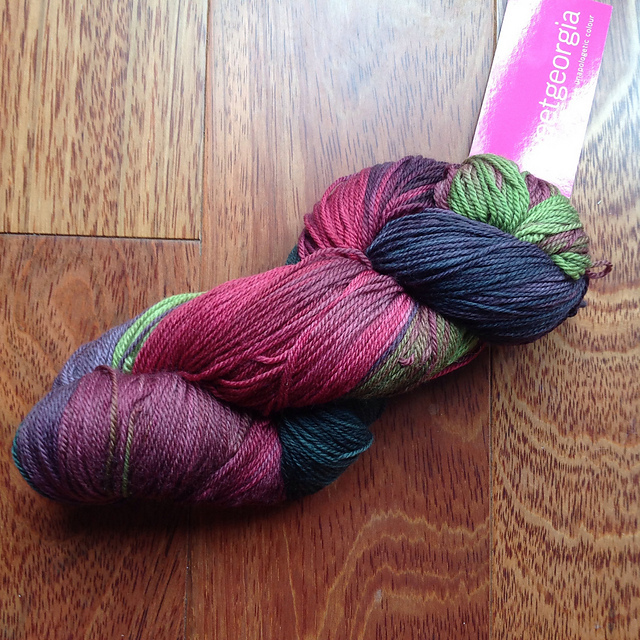 I also know I will buy more of the SweetGeorgia Tough Love Sock as it is lovely stuff and robust too. I may even be tempted to put it on my feet.